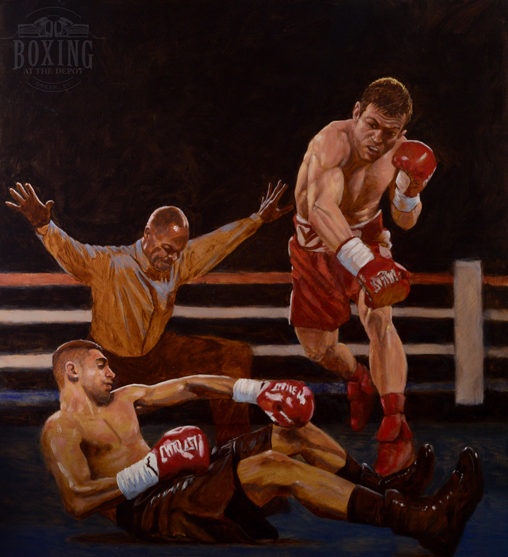 This boxing art painting measures 50 in x 50 in. The Canelo vs Khan match was billed as Power vs. Speed that ended in a knockout on May 7, 2016. The fight was Canelo Álvarez’s first defense as the WBC, Ring and lineal middleweight champion, and Amir Khan’s first fight at middleweight after moving up two weight divisions from welterweight. A catchweight of 155 lb was in effect, at which Álvarez had fought for his previous four fights. The fight was won by Álvarez, who scored a sixth-round knockout of Khan to retain his titles.